Notification No. 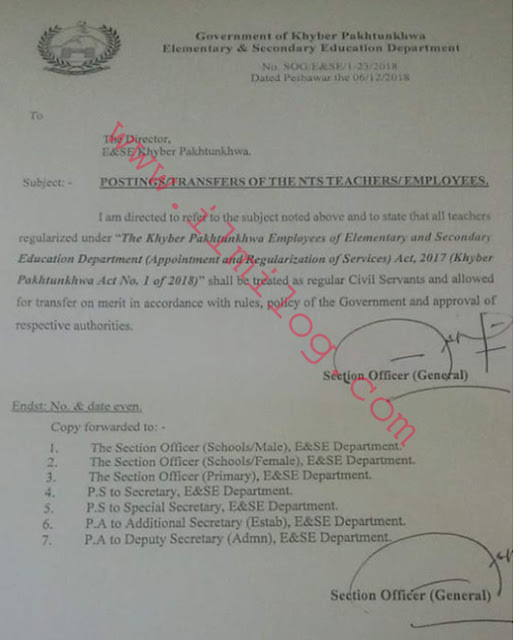 SOG/E&SE/1-23/2018 by Government of Khyber Pakhtunkhwa Elementary & Secondary Education Peshawar on 06-12-2018 regarding Education Department Postings/Transfers of the NTS Teachers Jobs KPK. Subject: POSTINGS/TRANSFERS OF THE NTS TEACHERS/ EMPLOYEES. I am directed to refer to the subject noted above and to state that all teachers regularized under -The Khyber Pakhtunkhwa Employees of Elementary and Secondary Education Department (Appointment and Regularization of Service, Act, 2017 (Khyber Pakhtunkhwa Act 1 of 2018" shall be treated as regular Civil Servants and allowed for transfer on merit in accordance with rules. a policy of the Government and the approval of respective authorities. I. The Section Officer (Schools/Male, E&SE Department. 2. The Section Officer (Schools/Female), E&SE Department. 3. The Section Officer (Primary), E&SE Department. 4. P.S to Secretary, E&SE Department. 5. P.S to Special Secretary E&SE Department. 6. P.A to Additional Secretary (Estab. ), E&SE Department. 7. P.A to Deputy Secretary, (Adman), E&SE Department.